Butterflies Mobile (msfmbutterflies) at Pure Design Kids / Toys / Flensted Mobiles ::: Kids' Toys, Furniture and More at Pure Design Kids! Think of spring, summer and nature - flowing and fluttering butterflies looping above flowers, searching for nectar. Watch them move in the natural breeze. The gliding, dreamlike movements make baby happy, and as the light shines through the overlapping, transparent wings, you notice a fascinating change of colors. 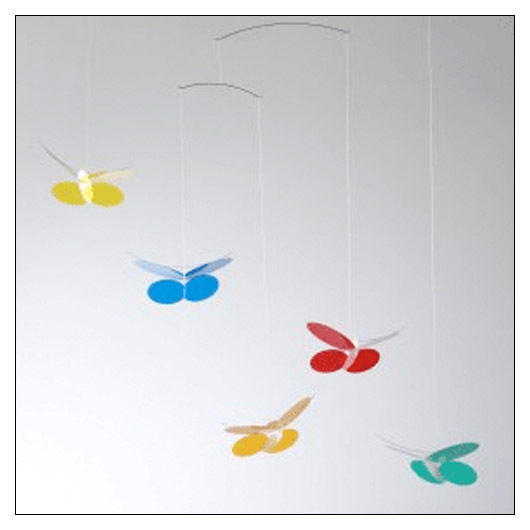 The mobile is very suitable to be seen from below, perfect for baby at the changing table! Each mobile is carefully assembled, and balanced by skillful hands. They are packed so that they are ready to hang.